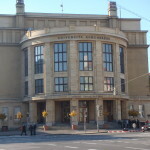 The principal education institutions in the field of ethnology and ethnomusicology in Slovakia are the Department of Ethnology and Cultural Anthropology of Comenius University in Bratislava, the Department of Musicology and Ethnology and Folkloristics of Constantine the Philosopher University in Nitra and the Department of Ethnology of University of St Cyril and Methodius in Trnava. University study in the field of traditional folk dance is offered at the Faculty of Music and Dance of the Academy of Music and Dramatic Arts (VŠMU) with a programme of studies in dance art, pedagogy and interpretation of dance. Questions of ethnochoreology constitute part of the study programme at the Department of Ethnology and Ethnomusicology of Constantine the Philosopher University in Nitra. Folk dancing is taught within the framework of the Slovak school system at the Dance Conservatories (the Eva Jaczova Dance Conservatory in Bratislava, the Private Conservatory in Nitra, the Košice Private Dance Conservatory, the Dušan Nebyla Private Dance Conservatory in Trnava and the Ján Levoslav Bella Conservatory in Banská Bystrica). Folk dancing is also taught at the Primary Arts Schools operating throughout Slovakia. A network of elementary schools which specialise in the teaching of regional upbringing and folk culture also operates in Slovakia. Besides formal education, it is possible to become acquainted with traditional folk culture within the framework of leisure time educational events. The National Centre of Culture and the network of regional and municipal cultural centres takes care of complementary expert education, methodological guidance and further support of the activities of folk collectives and talented individuals in the field of traditional folk culture. Those interested in learning about traditional folk culture can attend the Schools of Crafts organised by ÚĽUV – The Centre for Folk Art Production, or the creative and craft workshops, dance houses and various methodological seminars organised by regional cultural centres, non-governmental organisations, civic associations and individuals within the framework of one-time or cyclical events or as part of folklore festivals.